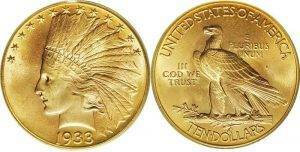 U.S. Eagle ($10) gold coins were 90% gold and 10% copper. 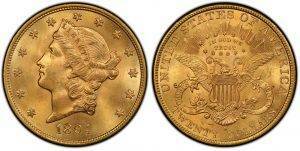 The 1837 standard resulted in a gold content of only 0.9675 troy ounces of gold per double eagle and 0.48375 troy ounces for the eagle. It would be used for all circulating gold coins until U.S. gold coin circulation was halted in 1933. The Indian Head eagle was a ten-dollar gold piece, or eagle struck by the United States Mint continuously from 1907 until 1916, and then irregularly until 1933. They Contain 0.48375 troy ounces of pure gold bullion. Pros: $10 Gold Pieces would be exempt from future gold confiscation based on their historic value. They would buy about $1,000 in goods and services in 1913 using the current dollar value. Smaller gold coins are easier to carry around in your pocket and liquidate. Recommendations: Buyer lower grade coins for bullion value and higher grade for collector value. Make sure your higher grade gold is slabbed and graded by PCGS or NGC. Want HUGE Discounts on Indian or Liberty Head $10 Gold Coins? You may also text us at 1-330-636-6292 for a Quote. *If you are looking for a rare coin, please indicate year, mint and grade in the comments section.